May 6, 9, 10, 11, 12 & 13, 1972. BB wrote: “It has been the policy of the Wick in recent years to present plays of an ever widening production scope and audience appeal. To-night’s play is no exception. Experiments with multi-set plays and the dimension of music in revues and recently Oh, What A Lovely War have enabled us to present this full musical play. This delightful – almost fairy tale – story was first presented by the Bristol Old Vic in 1954. It is full of comedy and fantasy, a commodity in somewhat short supply these days. “We emerged successfully from the looming shadow of the great power cuts and our last production, Lady Windermere’s Fan went off without a hitch. Our audience seemed very enthusiastic about the play and the only real cloud across the scene was the recent death of our President, Mrs. Elizabeth Penney. She had been our foundress and guiding hand for 23 years and we are certain she would have wanted the show to go on as usual. My very first meeting with ‘Molly’ was at her home during a rehearsal of her own play A Christmas Story, and I recall a great throng of people, some attired in multi coloured blankets, including the Rector Hugh Etherington. The centre of all the activity was Mrs. Penney, vital, authoritative, completely ‘at home’ among a crowd of young people. In fact, this was one of her great virtues – being involved and identifying with the younger generation – a mother figure. The loss of Molly ends an era and it is proper to reflect in these notes on her achievements apart from bringing the Wick into being. Her play A Christmas Story was presented three times at the Barn Theatre by the company and was always a moving experience, particularly in 1965 when it was dressed in Byzantine style with appropriate decor. She acted and produced, although for the most part was content to guide. She played Lady Bracknell and the old Queen in Becket. 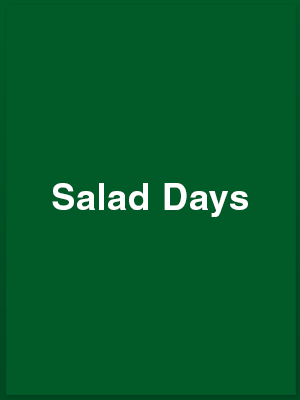 The entire membership of Wick Theatre Company will be on hand for the forthcoming production of Salad Days which will be given an extra performance on Saturday May 6, and then have a run from May 9 to 16 [sic] inclusive, at the Barn Theatre, Southwick. Bookings are coming in rapidly and seats can be obtained by dialling 873641. SO great has been the demand for tickets for Wick Theatre Company’s forthcoming production of Salad Days that an extra performance is to be given on a day in advance of the weekly of production. More than 750 tickets were sold before the posters went up advertising the production. The show is being presented at the Barn Theatre, Southwick, from May 9 to 13 at 7.45 p.m. The musical entertainment, by Dorothy Reynolds and Julian Slade, will be produced by Barrie Bowen. Eric Thompson and Peggy King are in charge of the musical arrangements and Barrie’s wife Miranda, is coaching the dancers. Leading rôles will be played by Sylvia Ryall, Michael Donkin, Sheila Wright, Jane Durrance and David Creedon. Nikki Le Roy will repeat his performance as Troppo. The box office at Southern Organs, Southwick-square, will be open on Monday, but tickets can be obtained before then by telephoning Shoreham 3641. Wick Theatre Company’s production of Salad Days at the Barn Theatre, Southwick, this week, was absolutely first class. The whole cast, by concerted team work, capture the mood of this delightful musical by Dorothy Reynolds and Julian Slade and bring out its vivacity and, at times, drollness. The singing and dancing are in the first flight and the acting is of the same high standard. Timing, which is important to every production, is excellent. The show is beautifully lighted and the decor is right. Sound and scenic effects come over well. Sylvia Ryall and Michael Donkin have the leads of Jane and Timothy and prove effective in their song and dance duets. David Creedon gives a gem of a performance as PC Boot and Nikki Le Roy is perfect as Troppo. Jack Bingham The Tramp to life in short appearances and again is good as Sir Clamsby Williams. David Creedon gives a good study of an effeminate hairdresser. The score came over well, especially lilting tunes such as ‘Look At Me I’m Dancing’, ‘It’s Easy to Sing a Simple Song’, and ‘We Could Never Look Back’. This is really a superb production. Producer Barrie Bowen is to be congratulated. Salad Days, currently presented at the Barn Theatre, Southwick, by Wick Theatre Company, is a hard-working play. Not only are there nearly 60 characters which 23 artists must portray with all the attendant changes of costume, there are 19 different scenes and there is the music. Probably the most hard-worked of the cast is David Creedon, who starting as one of the university dons becomes the sadly put upon PC Boot, evolves into the manager of the Cleopatra night club and the precious haute couturier Ambrose – all of them with a tremendous diversity and all of them well done. The leading rôles of Jane and Timothy are taken by Sylvia Ryall and Michael Donkin. Their songs are well handled, their characterisations are bright and cheerful, they help the play to go bubbling along from start to finish. John Davidson goes from dancing Bishop to very aristocratic Nigel Danvers, and Sheila Wright is a very good Lady Raeburn, joining Frances Moulton as Timothy’s mother in the delightful duet ‘We Don’t Understand Our Children’, and as the excruciating-voiced night club singer Asphynxia. Jack Bingham is the tramp who owns the piano that makes people dance and he is also Sir Clamsby Williams of the Foreign Office. Anthony Deasey has a marathon of appearances as a don, as Sir Clamsby’s assistant Fosdyke, as an American, as one of the arms dancers, as a Pressman and as Uncle Zed. Neil Shephard also has a goodly stint as a don, as Timothy’s father, as a police inspector, as Tom Smith and as Uncle Zed’s flying saucer pilot Electrode. Troppo, the deaf mute put in charge of the piano is played by Nikki Le Roy. Other taking part and all of them playing various parts are: Ralph Dawes [as passer by and Augustine Williams], Sally Bacon, Ann Baker [a delightfully pert Rowena], Jane Durance [Fiona], Moyra Martin, Mary Payne, Valerie Burt, Barbara Moulton, Susan Hollis, Jane Smith, Joy Talmage and Betty Dawes. Miranda Bowen arranged arranged the dancers and appeared as the principal arms dancer. Eric Thompson was musical director and, with Peggy King, provided the music on two pianos with David Green on percussion and Stuart Bartholomew on double bass. The music is delightful and excellently played. Other well deserved credits are to Barrie Bowen for astute direction, to Pat Moss for costumes and to Richard Porter for well organised and practical stage design. You have one more opportunity this evening to see this delightful show but ring Jean Porter on Shoreham 3641 in case they are sold out.